Dan taped his first One Hour Special for Comedy Central on October 17th, 2009, receiving a standing ovation after performing 65+ minutes of new material to a sold out house at the Bing Crosby Theater in Spokane, Washington. 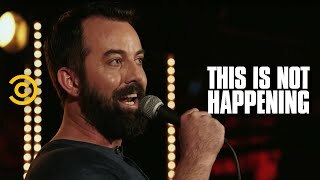 This yet-to-be named special, which premiered on Comedy Central in early 2010, is a follow up to his popular half-hour special, Comedy Central Presents Dan Cummins, which was voted the 3rd favorite 1/2 hour special in Comedy Central Present’s history by fans in the 2009 Stand Up Show Down. That 1/2 hour was made possible by Dan’s initial appearance on the first series of Comedy Central’s “Live at Gotham”, where one of Dan’s jokes was not only used to advertise his episode, but was used to advertise the entire debut season of the new stand-up show. Material featured in his 1/2 hour special and from the Gotham taping were released on his national debut CD, “Revenge is Near”, recorded at ACME Comedy Club in Minneapolis, MN, and released on Warner Brothers Records in June of 2009, reaching #7 on the Comedy Charts, and now being sold on itunes, on Amazon, and at Best Buy and various other retail outlets. In addition to his Comedy Central appearances, Dan has performed on the Late, Late Show with Craig Ferguson, Last Comic Standing, and Comedy.tv with Byron Allen. On November 26th, 2009, Dan will also make his debut on the Tonight Show with Conan O’Brien. Dan has also been invited to and performed at numerous, prestigious comedy festivals, appearing the Just For Laughs Montreal Comedy Festival in 2005 and 2009, and also performing at the Aspen Comedy Festival, Boston Comedy Festival, HBO Las Vegas Comedy Festival, and the Comedy Central South Beach Comedy Festival. All of these TV and festival appearances were made possible by a relentless touring schedule, with Dan headlining clubs and colleges in every state but Hawaii (c’mon Aloha State! ), and various cities in Canada, since walking into a comedy club in Spokane, Washington for the first time on August 3rd, 2000. After over 200 college shows since 2007, Dan was recently named one of the 2010 Hot Comedy Picks by Campus Activities Magazine, and he is currently filling up his 2010 calendar with more and more university shows. 2010 proves to be the biggest year so far for Dan, with more television appearances sure to come after signing with Creative Artists Agency in LA, where he’ll be moving in January to live with his girlfriend Kristin and her dog Tux. Dan will also continue to spend a considerable amount of time in Spokane, Washington, home to his ex-wife Heather, and their two small children Kyler and Monroe, with the children spending time in both Spokane and LA. Kyler looks forward to Disneyland, and Monroe and Kyler both look forward to a bunk bed in their new California pad. To keep track of what Dan’s up too, keep checking back here at www.dancummins.tv, on Facebook, Myspace, Twitter, and Youtube, and check out www.livinthedreammovie.com.